In part 1, I covered why you might want to use nanDECK in prototyping a card game, and in part 2, I covered how to build a basic template. Again, note that some cards intentionally leave these columns blank. I wanted to add some immediately resolved effects that should be distinguished from “standard” Encounters that remain in play until handled. In the simple example, we created a variable called [all] to save us from having to redefine our range in every directive. This was really a bit of lampshading on my part, because the syntax for “all cards in this spreadsheet” isn’t really clear. There are other reasons you might want to use them, though. Note that we could define our margins the same way if we wanted. In this case, it’s just easier to type out “0.25” than to write “[marginx]” every time and (these being prototypes) I don’t envision I’ll be tweaking layout much. As I said earlier, I want to have two types of Encounter cards–“standard” Encounters with numeric stats, and Encounter cards that trigger effects when flipped. 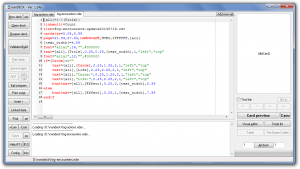 While I could separate these into different spreadsheets or create ranges in my script, that’s a huge hassle–I’m using nanDECK because I don’t want to have to micromanage my spreadsheets. We end by changing the font, but we don’t follow it up with a “text” directive that prints any text. Note that “font” and “text” directives don’t have to be back-to-back. nanDECK will remember the last “font” you specified. Here’s where the logic happens. We want to check if “Cards” (one of the two stats that our “standard” Encounters will have) is empty. If it is, we just want to show the description. If it isn’t, we want to show all our numeric stats ahead of the description. We start our block as follows, checking to see whether “Cards” is not a blank string of text. nanDECK’s “if=” seems a bit bizarre if you’re used to writing code, but remember, everything is a directive. To explain the rest of this jumble of punctuation, note that Cards is encased in [brackets] to denote it’s a column in our spreadsheet, the “<>” operator means “is not equal to”, and the empty quotes (“”) refer to an empty string of text. What comes next is indented for readability, but this isn’t nanDECK’s requirement. Once it encounters that “if” directive, everything that follows will be executed only if it’s true. nanDECK is looking for an “else” or “elseif” directive. Here we have more numbers, but if you remember part 2, you should be able to decipher this. We start out by creating labels for our numeric values, setting them along the left margin (0.25cm left) and 1cm apart from each other vertically (at 1.25cm and 2.25cm). Because the labels are small, we allow 2cm width. Next, we fill in the values. Because we’ve already reserved 2cm of width from the label, we set them at 2.25cm left, giving ourselves a bit of a margin. Since they’re on the same lines as the labels, our vertical values are the same. We’ll also allow 2cm here because numeric values will be short. Finally, we display the Description as HTML just below the last numeric stat, and have it fill the rest of the space on the card. “Else” tells nanDECK that we want to switch, and handle the opposite case–what should happen if Cards does not have a value. (Note that you don’t have to have an “else” directive for every “if”.) In this case, we want to display the Description starting at the top of the card. We finish off the block with an “endif” directive, which simply tells nanDECK that we’ve ended the “if” block. This is, admittedly, a simple example–you can, for example, nest “if” blocks inside of each other, or use “elseif” directives to define multiple conditions. This should be enough to get you started if you’re interested in using nanDECK. Remember, if you want to dive in to nanDECK, the manual will be your most valuable asset. It’s not always perfect, but it does cover every directive. 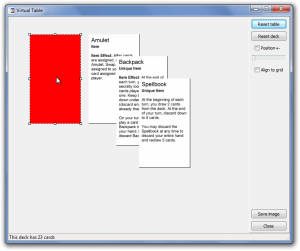 In part 1, I covered why you might want to use nanDECK in prototyping a card game. Now, let’s get into the nuts and bolts of building a template. In my last post, I mentioned that Player Actions were simple title-and-description cards. In fact, that’s all that’s really in my spreadsheet: Title, Description, and Count (for the number of copies of each card in the deck). Note that I’ve also got a calculated field in my spreadsheet showing the total number of cards in the deck–in this case, 86. “Description” belies some complexity: I want to be able to include line breaks and, if possible, formatted text. Of course, there’s the game design equivalent of a “code smell” here–if I’m regularly using the same mechanics over and over, then I probably need to introduce some keywords. And if I’m introducing multiple keywords, then maybe that needs to be its own column in my CSV, rather than a bold term that appears in the Description. For example, my Action deck has a few cards that players can keep for semi-permanent effects, so why write out “players can keep this, can only have one copy, etc. etc.” on every card? Applying the label “Item” would be far simpler, and then refer the player to the rulebook. Once we’ve got a spreadsheet set up in Excel or OpenOffice, we need it in a text format that nanDECK can read. 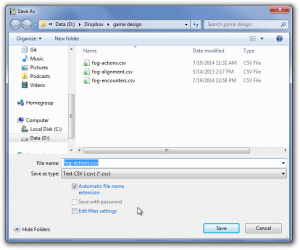 To do this, go to Save As… and select either “Comma separated values” or “CSV.” Don’t worry too much about options, as the defaults will work for most scenarios–just make sure that the delimiter is CSV. 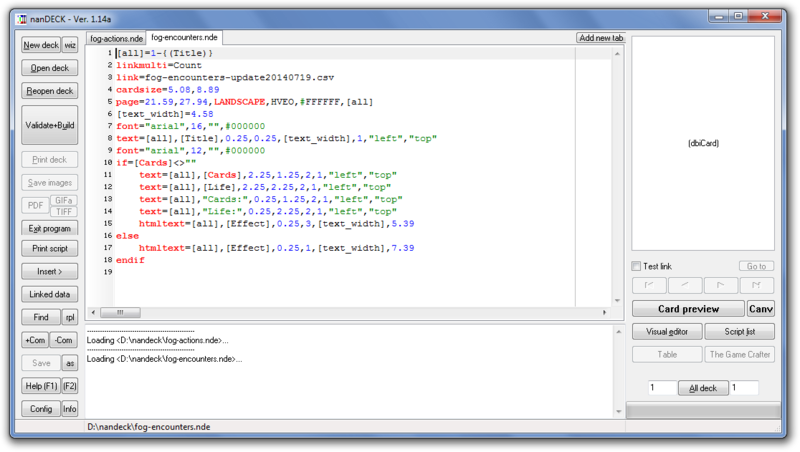 Building a template in nanDECK is somewhere between creating a configuration file, programming, and writing HTML. Every line starts with a directive (the text on the left side of the equals sign) that is passed a number of values (the list, separated by commas, on the right side of the equals sign). Next, we want to define the size of each card. nanDECK will use this to lay out our cards. I know what you’re thinking: those numbers look odd. That’s because nanDECK uses centimeters, not inches. (Yes, it’s a hassle, but Google will easily do these translations for you.) We’re just talking about a normal 2″ x 3.5″ business card here: width first, then height. Again, the first two parameters are in centimeters. We’re just telling nanDECK that our page is 8.5″ wide (21.58cm) by 11″ tall (27.94cm), in landscape mode, centered vertically and horizontally (the HV), has no printed guides on either odd or even pages (the EO), is white, and should be used for all cards in the set. That’s a mouthful, but remember: if we stick with one type of paper for all our card prototyping, we can copy and paste this into every template without having to think about it. This time, we’re telling nanDECK that our text block containing the Description value for each card should be formatted as HTML. That means our <br/> tags will be interpreted as line breaks, and we can use <b> or <i> to format certain bits of text. That’s all there is to it. If we type this into a nanDECK tab and click “Validate+Build,” we should see our cards to the right. We can then click “Table” to actually flip through our cards, ensuring that the randomization “feels” right. In the next post, we’ll get into conditional formatting. Sometime last year, I started playing around with prototyping a card game. At its core, it’s a hidden-loyalty game strongly influenced by The Resistance and Battlestar Galactica, but with combat influenced Lunch Money. As such, it’s required a lot of tweaking for the little playtesting I’ve done. I recently dug up and updated my prototype, throwing away long-removed cards and reprinting heavily marked-up cards. I won’t say nanDECK is a useful tool for every deck you need to prototype. 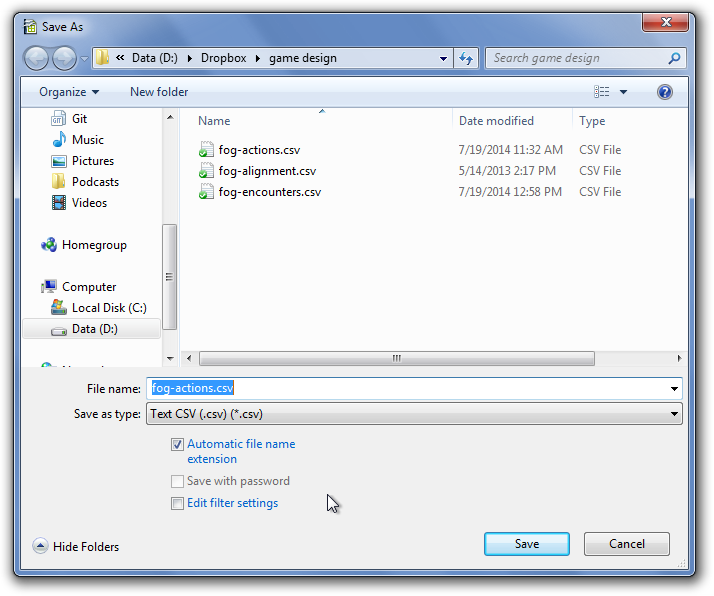 There are other programs that will spit out printable cards from a CSV–likely much, much easier to configure. nanDECK’s configuration is rather esoteric, and some of it feels like it slowly evolved out of bolted-on user requests. In part 2 I’ll talk about how to actually write these configurations. But for now, let’s talk about the reasons you would (and wouldn’t) want to use nanDECK. Testing card probabilities: My game contains multiple copies of the same card, so I wanted to be able to adjust the numbers to tweak the “feel” of the randomness (ideally, without having to print up cards). 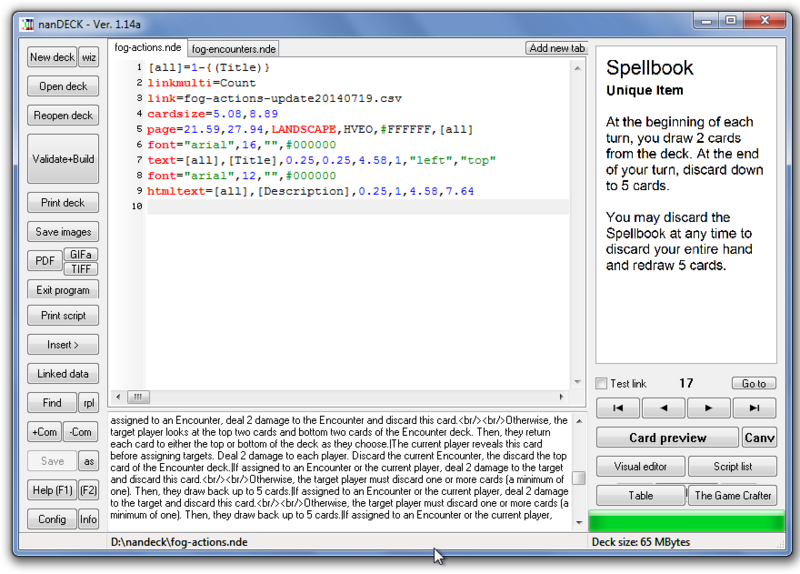 Fortunately, nanDECK has a “Virtual Table” feature that allows you to draw cards from a shuffled version of the deck. My own card layouts and spreadsheets: My Encounter cards don’t fit into a simple title-and-description format. Some (but not all) Encounter cards include some numeric values. While I could simply embed these in one long description, I wanted to make them columns in my CSV file. I also wanted my card template to conditionally hide these fields (and their labels) if they were empty in the spreadsheet. I needed to be able to force my cards into a non-standard 2″ x 3.5″ format, and (more importantly) ensure these cards were laid out matching the perforations. Simple title-and-text cards: If your cards don’t benefit from a custom layout, then it’s probably not worth wrangling nanDECK’s templating system. Unique cards: If there will be one and only one copy of each card in your deck, nanDECK isn’t going to be worthwhile. You’re better off using something like word (even if trying to maintain your card list might be a bit awkward). Anything beyond initial prototyping: If you’re adding card art or you’re no longer juggling card text on a regular basis, nanDECK is more complicated than helpful. At this stage, you’re better off laying out cards in a desktop publishing or graphics application.